A potentially life-saving public access defibrillator has been installed in the South Norfolk village of Wreningham, thanks to the parish council and the National Lottery. The automated external defibrillator can play a vital role in saving people’s lives and works by detecting an irregular heart rhythm and then sending an electric shock to restore a normal one. The £2,000 defibrillator, which is available to the public 24 hours a day, was paid for by a grant from the National Lottery and purchased off the Community Heartbeat Trust. It is now fixed to the wall of the village hall next to its car park, near the centre of the village. Parish council chairman, Michael Hill, said: “Our thanks go to the Mulbarton First Responders Group and the National Lottery for helping us to follow through on our plan to secure a defibrillator for the village. It is positioned at the village hall as it is well located and the hall regularly hosts sizeable events including dancing, Zumba and private parties. “We know that with a cardiac arrest, every minute is vital and the chances of survival go down by 7-10% with every minute’s delay in using a defibrillator. In the event of an emergency ring 999 and they will direct you to the nearest defibrillator and give you a code to access the box. The device will literally tell you what to do and will only give an electric shock if it is needed. It is perfectly safe for anyone to use, no training is needed. Wreningham Village Hall is located on Mill Lane, NR16 1AN. 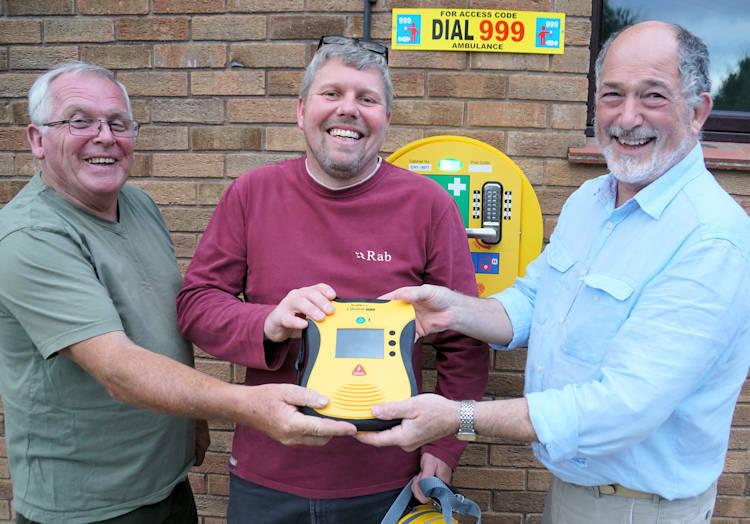 Pictured above is Michael Hill, right, with the defibrillator, and fellow villagers Hughie Glaves, left, and Chris Peachment.